I can’t say enough good things about these Rokons, and quite frankly, neither can their owners. They have a frame that can withstand the punishment of wilderness riding and an enormous ground clearance. They’re lightweight, have hydraulic brakes; and they have an engine you can’t kill. They pull, they tow and they climb like a mountain goat. If you have business out in the woods, these babies are your huckleberry. New in 2016, Rokon introduced the Ranger to add to the stable alongside the Scout and its siblings, the Trail-Breaker and the Rokon for Hunters. Continue reading for my review of the Rokon Scout and Ranger. To a certain extent, all bikes have a function-driven design to one degree or another, but as with all Rokon products, the Scout runs a decidedly high form-to-function ratio. Many of the frame members pull double duty as brush guards as well as structural support, plus a whole host of bits and brackets to accommodate the unusual 2WD drive system. The new-in-2016 Ranger adds a dual-sport flair to the Rokon stable with its street-legal components. A proper instrument cluster includes a digital speedometer, odometer, and tripmeter. Dual rear view mirrors, upgraded headlight, turn signals, license plate light, and reflectors are added as well as a horn (beepbeep) and USDoT-approved tires. 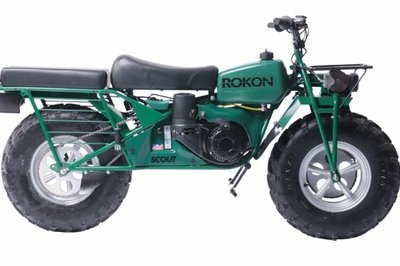 From the accessories catalog, you have a wide variety of gnarly goodies, including a log skidder, side car, tow bars, trailer, saddlebags, gun racks — if you have business out in the woods, there are accessories to set up your Rokon. And don’t let the weather slow you down. Rokons can drive through up to 24 inches of snow. Just to add to this awesome little ride, I’ve seen where folks put out-riggers on it and turn it into a little boat. Yeah, you heard me right. Small diameter, tubular-steel members make up the hardtail frame as well as the rigid front forks, and the only suspension component serves to buoy the seat to give the rider some modicum of protection. 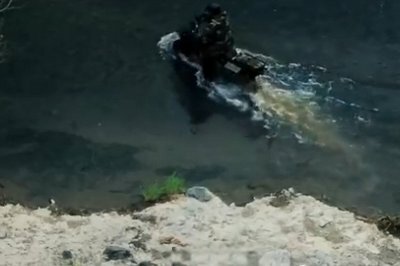 Most of the shock absorption duties fall to the large, eight-inch wide tractor tires that flex and give similar to ATV tires, and if this doesn’t seem adequate to you, bear in mind that you ain’t gonna be going very fast when you hit bumpy stuff, and you certainly won’t be jumping any railroad tracks. Not only do the tires provide some bump moderation, they can also be used to store fuel for extended forays into the wilderness. 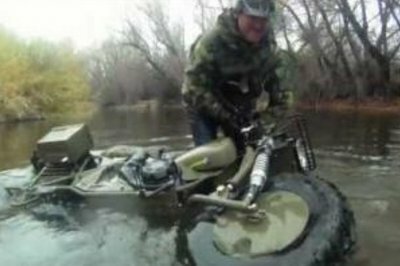 If that ain’t enough, when the tires are filled with nothing but air, they provide enough flotation to float the bike across bodies of water in situations where the 22-inch, fordable-water depth (24 inches for the Ranger) isn’t quite enough. Brakes at both ends are controlled from handlebar-mounted levers, and they are of the hydraulic disc variety. 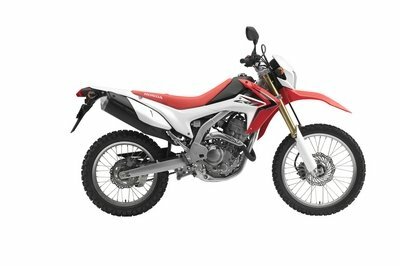 Ground clearance is enough to embarrass most off-road bikes at 13-inches high, which pushes the seat up to 31 inches on the Scout, and 14 inches of clearance and a seat height of 32 inches on the Ranger. Even with that amazing ground clearance, the seat heights are still lower than the majority of dirt bikes. While the vertical measurements are on par with full-sized off-road bikes in general, the 51-inch wheelbase length definitely shoves the Scout and the Ranger into the “compact” category. As always with Rokon, the powerplant and drivetrain are the most interesting aspects of the pair. A one-lung, 208 cc, four-cycle Kohler engine generates 9.1 pound-feet of torque backed up by 7 horsepower. That’s right, it’s basically a lawnmower engine that powers an automatic torque converter, which in its turn powers a hydrostatic drive that sends torque to both the front and rear tires for two-wheel-drive capabilities. 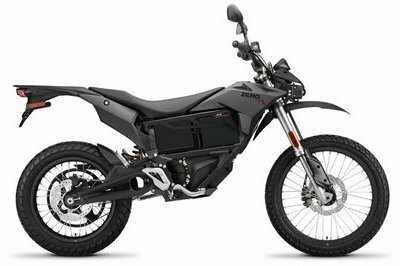 The engine comes with both electric start and a kicker, a comforting feature given the nature of this bike and its designed purpose. Since it uses a hydraulic drive system, the transmission doesn’t serve the same purpose as on more conventional bikes; it serves to define the power-to-speed ratio for climbing up to 60-percent grades or performing towing tasks. First gear is good for 0-to-16 mph, second gear goes 0-to-20 mph, and third gear delivers a blistering 0-to-35 mph, all while sipping the gas for a 0.33 gph fuel consumption rate. Note, that’s gallons per hour, not miles per gallon. In true “apocalypse-bike” fashion, engine parts are easy to get, or salvage if needed, and all hardware can be found at your local hardware store in common, American sizes. Not only that, but the owner’s manual comes with bonafide service-manual information complete with cylinder bore measurements to let you do serious machine work during a rebuild. It’s no wonder why this bike is on my husband’s “zombie survival” list. MSRP on the Scout is $6,775 and the Ranger will run you a little more at $8,375 for all that street-legal goodness. Both prices are up a couple of bills from last year. 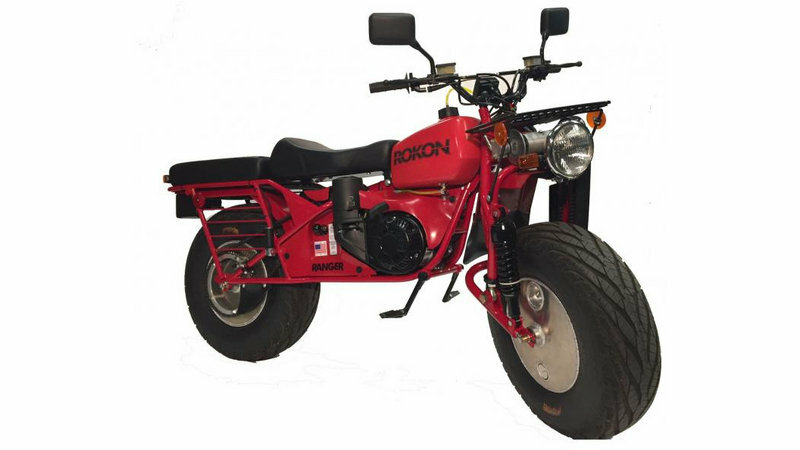 Rokon gives you a 12-month limited warranty and offers you either ride in your choice of Olive Drab, Forest Green, Black, Yellow, Red, or Orange. As usual, Rokon is so far into a class all its own, it’s a challenge to find a direct competitor. Forget apples-to-apples, everything else out there is more like an orange or a kiwi fruit. 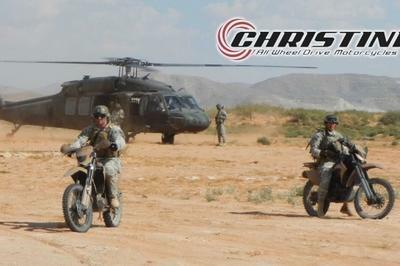 Among the considered models, two stand out as being capable of similar tasks even if in a vague, peripheral sort of way..
Christini makes a dirt bike with AWD, but uses shafts and gearboxes to make the wheels go ’round. 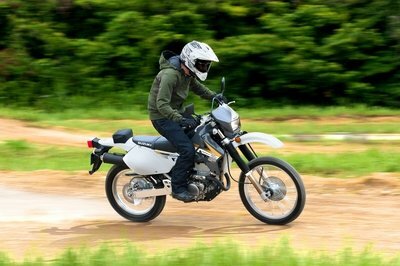 Plus, it’s built like a “proper” dirt bike, and at a casual glance could easily be mistaken for same, unlike the Scout. On some strange parallel, both are off-road-tastic, 2WD-capable motorcycles. 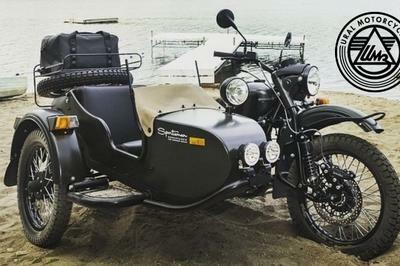 In the interest of fairness, the Ural Gear-Up qualifies as a multi-wheel-drive, off-road-capable vehicle since the sidecar wheel can be engaged, but that isn’t quite the same as having a powered front wheel. 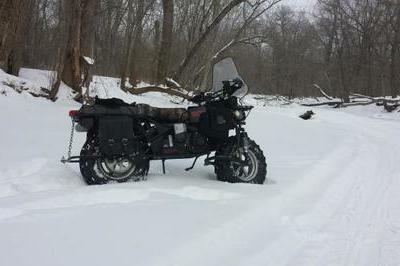 In this case, 2WD isn’t quite the same when you have three wheels and the Ural won’t pull as steep of a grade under the same conditions as the Scout. 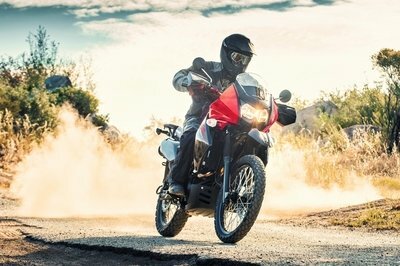 Both of these “competitors” are more appropriate for road use, but that’s hardly a strike against the Scout, since it’s designed almost exclusively for the wilderness and even though the Ranger is street-legal, you aren’t going to tear up the highway on one. If the Scout fits your intended purpose, nothing else will do. I think in order to really find a competitor that more closely competes with the Rokon, I’d have to look in the ATV/UTV market and I’m just not prepared to do that.